Don’t wade through the murky waters of the Main Hall, creatures lurk within the poisonous waters. Stay on the path or risk taking damage. Giant trees loom over head, homes built into the side of them with raised platforms connecting them together. At the end of the swamp there is a tent sitting on a raised platform. Enter to find the door to The Midway. As Azix and Garret would tumble into the dungeon, before them would lie a world entirely unlike the one they had just left. Rather than the icy expanse, the air was almost humid and quite warm. Around them would be what appeared to be a swamp of sorts and it stretched on for quite a distance. 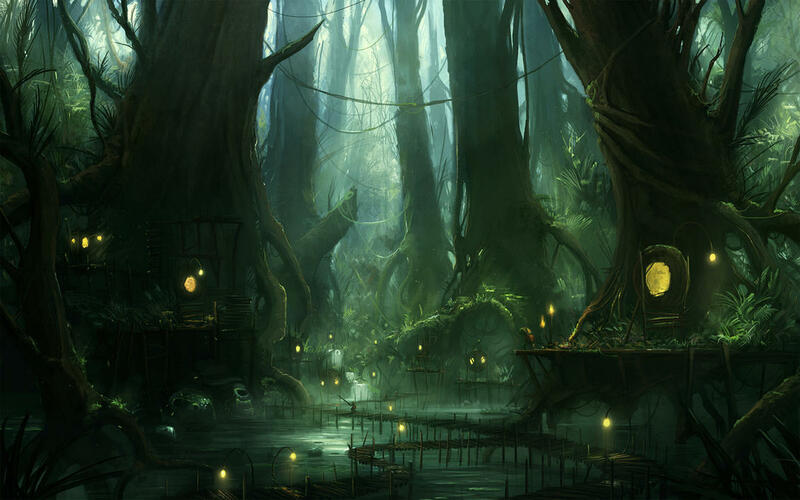 Between the entrance area and their goal would be giant trees, murky waters and wooden pathways. If one had sharp vision, they might see the trees seemed to have small lights glowing from holes in the side. Hanging from the trees and covering the walls were bio-luminescent fungus that gave the entire area a dim glow. The paths were wide enough to show they were intended for humans, but at only two meters wide, there was not much leeway. The entire area seemed to have a sickly green tinge to it and the air smelled musky. All around, the hum of flying insects could be heard. There was only one initial pathway from the Gate, but about 20 meters on the main path would lead to a sharp turn to the right before the path split into two, allowing a person to go left or go straight on a path that seemed to follow the edge of the massive room. Azix wiped the sweat from his brow as he surveyed the swampy landscape before him. Large trees rose from the murky depths and stretched for leagues into the sky. Azix noted that around many of the trees there were bridges and pathways that connected them. Looking closer closer he noted that homes had been carved into the trees as well. So far, he did not notice any inhabitants, giving the swamp an eerie vibe. The effect was further increased by the bright bio-luminescent fungus and the swamp waters cast a murky green fog in the humid air. With a bewildered look on his face, Azix's fingers found his staff and he cradled it in his left hand. He turned to Garret and spoke in a low tone, "A village inside the dungeon?" The land inside Bifron's dungeon had been cavernous, full of glittering jewels and gems. Growing serious, he turned his mind to the task at hand, "Ready? If Garret affirmed, Azix would proceed forward along a wooden platform over the stagnant, pungent waters. His eyes surveyed the surroundings, keeping an eye out for any threats that may appear. Some time passed before they reached a branch in the path splitting to the left on one side and continuing ahead along the other. Either way they choose it seemed to carry them further into the swamp. "Left?" Azix instinct made him lean towards that decision, but he inquired Garret regardless. Azix trusted the Spymaster's instinct and over the course of their travels it had gotten them out of some dicey situations. As a result, they had become a solid team and Azix believed it was because they shared similar ideals and a similar fate. Unless Garret objected, Azix would lead them down the branch that took them to the left. Description: A magical flying carpet that allows the user to soar through the sky. It measures 2 meters in width, 3 in length, and about 20cm in terms of thickness, making it quite flexible. This magical carpet gives a 25% word count reduction on traveling topics. The carpet can fly at a speed of 25 m/s at to a height of 60 meters. The carpet can hold up to 5 people at a time before being weighed down. *The carpet is indestructible, however it can be taken by force by anyone and made their own property. Damage still goes through and around the carpet, but none is dealt to the object itself. *Can be purchased once per person. Appearance: A single glove made of a silky smooth, white material. A magic circle is stitched into the back of the glove granting it magic power infused with Caim's razor spells. By paying 20 magoi the wearer of this necklace once a thread can revive a person from the dead fully healing all wounds they receive and stopping that person from losing a life. Appearance: A large chain with a red gem at the end, wrapped with gold wire. The gem appears to have lightning shimmering through it. - The user can register 1 Storm Ability to use by wearing the charm which must be trained. The ability can be C-tier or below. - By paying 5 magoi once per use, the wielder can manipulate the weather in a 15 meter diameter within 20 meters of themselves. This may include snow, storms, tornados, rain, etc. The sudden change in their environment was not a terrible surprise to Garret, yet even if he was mentally prepared for it his body was not quite there. He shivered, just slightly, as he walked forward alongside Azix. The smell of the place hit him next, and he crinkled his nose momentarily. Pulling out Kuroi Shimo in his left hand, the blue Magician kept a close eye out around them. He recalled that in their prior dungeon, there were inhabitants that were immediate threats to them, and was equally wary of such beings within this dungeon. The swamp, while Garret disliked it in general, was a welcome sight to the magician; large amounts of water nearby only served to make his spells easier to cast. He looked closely at the water for the telltale signs of blue rukh. Azix spoke up moments later in regards to the dungeon housing a village and Garret took a closer look around him, frowning. "But who would live in such a place?" He supposed people could live anywhere, though, considering the Imuchakk lived in icy landscapes, and those in Heliohapt lived in an extremely hot place in the world. Garret nodded to Azix when he asked if he were ready. "Of course." The blade, Desceld, strapped to Garret's left hip was secure in its place. The Magician had taken care, equipping himself to the best of his ability, and had even brought out the old Hex Gauntlet he had received when he had been conscripted into the invasion force. That gauntlet was secured on his right hip, and there was the Prismatic Dagger he had purchased a while back that was on a bandolier drapped across the man's chest. Though it was not something that would assist them in battle, Garret held upon his person, in a necklace around his neck, the signet ring that signified the work he had put in for their country up to this point. It was an object of great pride to the man. "That should be fine. Regardless of which option we choose, I am confident in our ability to reach the end successfully." Garret was unconcerned with which direction they went, advising the Light Magician that they could proceed whichever way he believed preferable. [b]Appearance:[/b] The wand itself has engraved arcane symbols, with a black finish. It is 30.5 cm, or 1 ft, long. The end of the wand is pointed. [b]Appearance:[/b] The Gauntlet is made of two different materials; the metal material that creates a harder impact site at the knuckles, as well as braces the mid part of the arm, and the cloth that covers and provides dexterous use of the fingers. The gauntlet is black in color, and upon the right hand gauntlet there is a spot where a gem can be placed. The index finger is the only finger at this time that has metal fixings, creating a sharp point at the end of it. [b]Appearance:[/b] A 30cm long dagger carved from a pale crystal ore and polished down to a smoot surface. The dagger has a one handed grip and is engraved with a magic circle at its pommel. [*]Allows the user to use parry abilities on light magic spells, regardless of their size or area of effect at a cost of 5 magoi. The cost is paid on top of the stamina cost of the parry ability. 5 post cooldown. [*]By paying 20 magoi, the wielder can stab the dagger into the ground and raise a 10mx10m wall in front of themselves that is 1m thick. The wall requires C-tier damage to destroy and is capable of reflecting up to 1 B-tier light spell back at its source. 5 post cooldown. [*][b]Description:[/b] The blessing is activated when feeding and infusing the sword with magoi. This spell creates a golden healing mist shaped in the form of a Kou Dragon. This dragon is 1 meter long and .2 meters in diameter. This 'dragon' moves and flies about at the will of the caste at 20m/s within 30 meters of the caster. 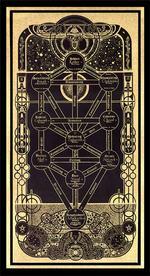 Upon coming into contact with a living being, the caster may choose to activate its effect. The mist enters and dwells within the body of a being it came into contact with after activation, creating an imprint of that living creature's body's peak condition. It advances the healing process of the body, healing up to B-Ter damage that was dealt to the body over the next three posts. This spell may be sustained to generate another healing 'dragon' mist on the user's next post or maintain any mist that has not been activated. [b]Appearance:[/b] This blade holds a black edge to keep it from glinting in the night. Otherwise, the blade itself is fairly standard. The handle is 13 cm in length, with the blade being 57 cm in length, making the total size of the double edged blade 70 cm in total. 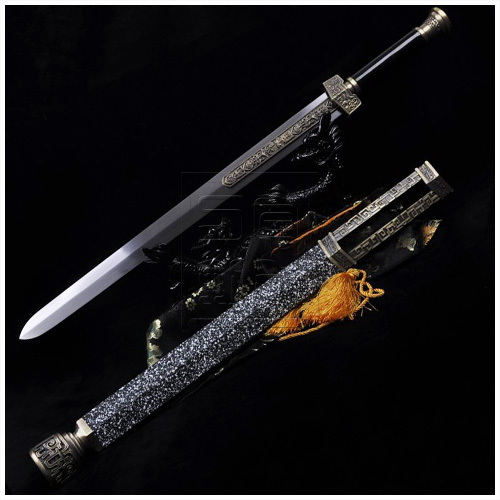 The classification of sword is of the Longquan variety, a traditional Kou blade. Appearance: The ring is a golden ring with a dragon insignia etched upon its surface. Within its grasp is a diamond, and upon the inside is the Kou insignia. The ring serves as a show of station. Those whose standing is mid class and higher would immediately recognize the meaning behind the ring. The stamp is an official seal of his station, used to press upon hot wax that seals a letter. *This item is for RP purposes only. It does not take up any item/weapon slots. As the two men would wander down the main path and then take the left route, the sound of buzzing would increase. If they were to look around, they would see that flying near them were small sprites, approximately the size of their palm. If either were to hold out their hand, a sprite would land there for a moment and look at them with wonder before buzzing off quickly to the nearest tree, taking refuge in the small homes created there. If they were to look to the path that had went straight, they would see a group of these sprites in the middle of a battle with a small group of Pesky Flies, defending their homes from the group of plague-ridden flies. If they were to look to the left, they would see more trees rising out of the murky water, which seemed to be getting deeper the further they walked. Ahead of them, in the far distance, they would see a large tent set up. If they were very observant, they might notice the waters near the path they were on rippling, a sign that something large was swimming just beneath the surface. At various points along the path, the sprites could be seen taking vines and twining it around loose boards in the walk way, securing them for the visitors. High overhead the sounds of more insects and the hoot of owls could be heard. The glowing fungus seemed to get brighter and a glance across the water would show small islands of rock in the muck, the rocks glowing from the amount of fungus on them. The rhythmic flapping of wings grew more audible the further they walked and it took a moment for Azix to find the source. Fluttering around them were small humanoid being with wings, gazing at the two Kouen men curiously. Azix paused, studying the fascinating creatures and held out his hand. The sprite landed in his outstretched hand and blinked up at the large man. Both Azix's and the sprite's face reflected wonderment as they stared at each other. Suddenly the sprite lifted off of Azix's hand and sped off towards a nearby tree. Azix chuckled as he watched it fly away, "That's amazing." He spun around in a small circle, taking in the scenery with a new eye. Through the trees, Azix could see that if they had kept going straight instead of turning, they would have come across some large flies. Azix tilted his head, catching the glimpse of something darting around the flies. The longer he watched, he realized that the faint darting motions were the sprites. It was almost as if they were fighting with the flies. Azix raised a brow and glanced at Garret, "Is it just me or are they fighting?" Without waiting for a response, Azix tugged at the man's sleeve and started running back down the path to take the other branch of the path. He wasn't sure why the flies had caught his attention, but now he was interested to have a closer look. When he arrived within ten meters of the Pesky Flies, Azix's pace slowed to a walk. With a closer look, he was sure that the two groups were fighting. From Azix's perspective, the gentle and curious sprites were being attacked by the Pesky Flies. Drawing conclusions based on his own experiences, he was reminded of his younger years, being bullied by those bigger or those who thought themselves better than himself. He also was reminded of the stigma that the people of the slums had experienced. For these reasons, Azix reacted to defend the sprites, defend the weak from the strong. "Little guys! MOVE!" He shouted as he raised his staff. Giving the sprites a moment to begin moving out of the way, he called to the Rukh around him. Five Fragments of Light formed before him, each pulsating with a blue tint, before being sent towards the flies. The meter long fragments were not very powerful, but they were meant as a deterrent against any further violence towards the tiny humanoids. Description: Azix issues commands to the ruhk, creating five 1 meter by 2 meter long jagged fragments of light that travel towards an enemy at 10 m/s, causing D-Tier damage if struck. If sustained, can reform the Fragments of Light and deal another round of D-Tier damage. Garret's focus, unlike Azix, was based upon the dangers that the swamp could pose to the two. While he was aware of creatures flying about, he did not pay too much attention to them. They were not hostile, and so they only warranted being noted. He heard Azix chuckle as one of the creatures flew out from his hand. Garret didn't realize that they would land upon the hand of a stranger so easily. Shaking his head, he simply continued to keep a watch out on their immediate vicinity. Shortly after, Azix stopped and tugged on Garret's arm, pointing to something off on another path. Garret glanced, noting human-sized flies off in the distance. Azix asked Garret if it looked like they were fighting and, upon closer inspection, he noticed that there were more of the sprite-like creatures that were, in fact, fighting. Azix pulled on Garret's shoulder, urging him to follow. It wasn't a difficult decision for the spymaster. He had already decided to follow Azix's lead, and the man rushed behind the Marquis to follow up on his choice. 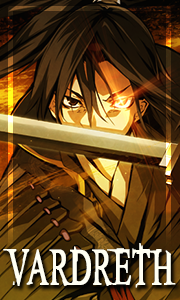 As they ran forward, Garret pulled out Desceld in his right hand even as he continued to hold Kuroi Shimo in his left. Azix raised his staff, shouting out for the 'little ones' to run away. Working in tandem with Azix's spellcraft, Garret awaited until a path was clear and ran forward. He stood in front of Azix before quickly kneeling, allowing the Marquis a clear line of sight to the scene before them. Neither knee touched the ground directly, but one knee was certainly closer than the other. This offered Azix the greatest pan of view while simultaneously allowing Garret to move without having to get off his knees first. As Azix and Garret would turn and run for the other path to assist the sprites, they would see there was a group of two dozen sprites up against five Pesky Flies. Description: These flies move at 10m/s and fly around without a seeming pattern, while inflicting a poisonous bite. Each fly is 1 meter large. Abilities: Pesky Flies can D-tier biting damage and can leave an opponent poisoned for a single post. The small sprites were using their greater numbers to try and overwhelm the flies attempting to invade the tiny homes created by the sprites. Here and there, a sprite would fall and then catch its breath before going back in for the attack. At Azix’ shout to move, several of them looked over, stunned before immediately scattering away from the Pesky Flies. The flies, confused by the sudden lack of assault, regrouped just in time to be struck by Azix’ Fragments of Light. They fell to the walkway at Garret’s feet, they legs twitching before falling still. Suddenly, from the left path, they would hear a great splash as an Anaconda shot straight into the air, jaws snapping at an owl flying too low. The Anaconda would then come crashing down, destroying the pathway on the left with a crack of timber. When the sprites saw the flies defeated, there would be an excited twitter of an indecipherable language before several of them flew directly in front of the two men. Tugging at the men’s clothes, they would point frantically to the Gloomy Owl flying fifteen meters above them, trying to tell the men something in their high pitched, frantic tones. If the men were perceptive, they might notice that the Gloomy Owl the sprites were pointing at had something struggling in its claws, another sprite. It would appear that this first room was full of clashing creatures as each tried to make its own home in the murky swamp. Description: Gloomy Owl flies at 20m/s and is three meters large. Abilities: Gloomy Owl has excellent night vision and can see up to 50 meters away. The Pesky Flies dropped like, well, flies after being hit by his spell. Azix heard a loud splash to his left, but his attention was soon turned back to the sprites who were frantically pointing at something above them. He looked up to see a humongous owl flying above them with something in its claws. Upon closer inspection, Azix noticed it was another Sprite at the mercy of a larger creature. With his free hand, Azix grabbed one end of his Magic Carpet that hung at his waist and pulled it out while filling it with magoi. The Carpet came to life and he jumped on, "Let's get that owl!" Once Garret was safely on board, Azix guided the carpet in a maneuver to put them in front and a bit to the right of the owl. Azix figured a head-on approach would be advantageous, recalling stories of how two warriors would face head on with spears in the sport of Jousting. "I'll save the tiny dude, you take out the creature." He moved in close enough for Garret to attack the creature, while positioning himself to catch the Sprite if the owl released it. Garret looked at the sprites, comically tugging at his clothing. Their entire demeanor seemed innocent, and Garret couldn't help but wonder what they were trying to say. Some of them were pointing upward, however, and Garret looked to see what they were pointing at. Above them flew an owl, and within its grasp was one of the sprites. Azix wasted no time, having seen the creature at the same time Garret did, and brought his magic carpet out, calling Garret to jump on and join him. Garret put his wand away; his magic was powerful, but it had no place in a battle where he would have to be careful about who he hit. With Desceld in his right hand, and his left hand empty, Garret jumped onto the carpet with Azix. Garret got to the side of the carpet and held his blade close to his body. The blade was parallel to the carpet, though there was only about 20 cm of space in the distance between Garret and the end of his blade. This was due to the fact that Garret was cocking the blade back, preparing for a stabbing motion to take place. Azix had explained that the plan was for Garret to attack, and Azix to save the sprite. "Others wouldn't care less about the well-being of those creatures. This is why I support you, Azix. One who could care for others, equally, without regard to race or creed or clan. That was the type of person Garret was determined to follow. They would be the closest to unifying the land in a peaceful manner. When Azix began to head straight for the beast, Garret laughed. "I will joust it from the sky, Azix. Just you watch." If the beast attempted an attack of its own, Garret would use River Styx Style: Redirecting Blows in order to backhand slap the attack inward and to the left of himself, diverting whatever blows came their way into the small space between the two. Simultaneously, Garret would be thrusting with Desceld, plunging the blade deeply into the beast's breast and hopefully allowing the two of them to contain the beast on the carpet while landing safely. Description: The user takes note of the direction and speed the opponent's attack is moving and, moving at 20m/s, the user redirects the trajectory of up to 15 attacks that add up to A tier damage with circular/rotational movements of their arms. The Gloomy Owl let out a Night Terror screech before tucking its body into a dive, intending to use Pecking Beast on Garret, the sprite still clenched in one of its claws. The men would likely be deafened by the cry. When Garret swatted it to the side, the Gloomy Owl released its hold on the sprite, dropping the small body onto the carpet before raising its talons to try and claw at Garret’s face as the blue magician stabbed his blade into the owl’s side. Letting out a cry of defeat, the body began to fall, the open wings carrying it off the side of the carpet. As it fell beneath the carpet, another Anaconda raised up to snap the falling bird out of the air. Four of the sprites flew up to meet the carpet, immediately seeing to their injured comrade, feeding it tiny pieces of the glowing fungus. Two of the sprites turned to fly directly in front of the two men, twittering and squealing, though the expressions on their tiny faces were seemingly thankful. They seemed unaffected by the deafening screech of the owl. The one in front of Azix would then point to the tent that was now closer than before, flying near his ear and chattering in earnest, though no words could be understood from the tiny creature. If the men were to look back to where they had initially confronted the gloomy owl, they would see a massive group of sprites gathering there before, with a shrill battle cry from tiny bodies, they would disperse. If they continued to watch, they would see the sprites break off into groups of six, each one of them heading for any nearby owls, dancing a dangerous flight path around the owls to seemingly keep them distracted. Each group was evenly spaced around the carpet, ensuring no other enemies came near to the five sprites and two magicians riding the magic tool, acting as a guardian force as the sprite near Azix pointed to the tent. A piercing screech from the Gloomy Owl resounded within Azix's ears, but he didn't let it deter him from catching the Sprite once it was let go. The tiny fey-like creature would land into his outstretched palm. "I got you, little dude!" He was so excited the plan work, he didn't notice the strange sensation of not being able to hear his own voice. The Gloomy Owl's screech had left the yellow magician temporarily deaf, so he did not even hear the anaconda splash out of the bog water. Four more of the sprites flew up and Azix noticed he couldn't hear their shrill voices, but their gestures directed him to look towards his left. He turned his head to see a tent in the distance, through the trees. Azix tilted his head, "I think they want us to go over there." Azix raised his hand to point, but halted in mid-motion. The realization that his hearing had gone, reflected on his features and he glanced towards Garret. Azix looked around to see if there were any other signs of threats, since he couldn't hear them approaching if they were there. Behind the two men, a group of sprites gathered in a mass before breaking off to fight other owls. Seeing so many countless battles, Azix understood that the Sprites were thankful for the help and were also showing them the way forward. Clearly, this battle would be going on for some time and if Azix continued helping the Sprites, he would never find the power of the Djinn. Once Garret's seat was secured, Azix would turn the carpet back down the left path towards the tent, leaving the Sprites to their battle. The carpet sped towards its target to land a few feet in front of the large tent. Azix stepped off gingerly, keeping a cautious eye out and rolled his carpet back up to tie around his waist. He turned his gaze from his surroundings to study the tent. Was this supposed to act as a door to the next room or was there something hidden inside? With a quick glance at Garret, Azix opened the tent to search inside. The screech from the owl had caused Garret to lose his hearing. It was a sensation he had noted fairly quickly after the fact, as he was constantly using those senses during combat in order to stay aware of his surroundings. He did not allow the loss of hearing to distract him, however, as the beast before them would have been given the opportunity to harm them. To what degree... Garret was unsure, at first. When the back of Garret's hand had moved, it did so in good timing, connecting with the Gloomy Owl and pushing it to the side. It took some effort, but he had the strength and skill to do so, and immediately recognized the beast as a powerful one. Perhaps it was the surprise of the contact that the Gloomy Owl had with Garret, or perhaps it was some other reason, but the sprite had fallen from the owl's grasp and into Azix's even as Garret plunged his blade into the Gloomy Owl's breast. The creature shuddered on his blade for a moment before falling from the blade and down, towards the swampy water. Garret's eyes followed it and grew wide at the sight of another Anaconda snapping the creature up from the murky waters. Garret watched as the sprites came up to greet them, and began feeding the wounded sprite some sort of healing food. He stared, slightly in wonder at the sight before him. While it was not something that could be seen on his face, it was certainly something that warmed the Magician's heart, if just ever so slightly. When Azix notated to Garret that his hearing was gone, Garret simply nodded and replied in sign language. You must have been focused on other things. It has been like this since we engaged the flying beast... I believe they are trying to buy time for us to get past the remaining obstacles, here. As they continued flying forward, Garret watched the sprites at work. Most of it was delaying tactics that he saw, but they were using what they had to do what they could; he could certainly respect that. When Azix had gotten off the carpet to enter the tent, Garret had followed. Garret sheathed his blade and took a step to follow Azix forward. As a sudden thought came across him, he crisply turned around to the swamp and clasped his right fist into his left hand while bowing thanks to the creatures for their help. If the previous dungeon was anything to match up against this one, they still had a ways to go before they could get to the end. When Azix and Garret would enter the tent, they would find it was much more expansive than it initially looked. At the far end of the tent, they would find a door, but first, they would notice a rather interesting looking altar on the floor in the center of the tent. As soon as they entered the tent, they would notice their hearing began to return and the joyous sounds from the sprites would hit their ears. Once they were fully through the front flap, the four sprites would waste no time in gathering the fifth, injured sprite from Azix, carefully carrying it to the altar in the center of the floor. A sort of song would fill the air as the four sprite would sing and dance around where the fifth sprite lay and as they sang, a glow seemed to begin coming from the ring of runes around the altar. Their volume increased, making the glow more intense until the tent was filled with a bright light. When the glowing light faded away, in the center of the altar would be the fifth sprite. Instead of the small sprite that had been there, it seemed to have grown, revealing it was very obviously a female sprite. Leaves covered only the most delicate of regions, forming her clothing and she was in a kneeling position. Her hair cascaded down her back and now that she was larger, a slightly green tint could be seen on her skin. Around her neck was a large green emerald, which she slid off and lay in front of her on the altar. The other four sprites continued singing and dancing, their speed increasing with every spin around the altar. If the two magicians were looking closely, they would notice the outline of the dancing sprites would seem to blur slightly until they seemed to become nothing more than a flutter of rukh. The female sprite on the altar would join in the song as the voices of the other four tapered off, the rukh-sprites absorbing into the emerald. She gave the emerald a sad smile as she sang, the melody shifting to one of sadness. The song finally tapered to a stop and the emerald gave a brilliant glow for a brief moment before the female sprite picked it up and stood. Moving in front of Azix, she would hold out the gem with an encouraging smile, twittering something in her foreign tongue. If he were to take the gem from her, she would then lean forward and brush her lips across his cheek before moving to stand in front of Garret, her gaze curious but friendly. With a giggle, she would lean forward, giving him a kiss full on the lips before mimicking the bow he had performed outside of the tent. She would then move back to the altar and wave her hand to the door behind her before the runes around the altar would glow again, filling the tent once more with blinding light. When the light faded to normal, the female sprite had returned to her normal size and flitted about the two magicians happily before exiting the tent. If the two men were to examine the door, they would find a depression in the shape of the emerald. If they were to place the emerald in the depression, they would hear the turn of a lock before the emerald would fall back into the hands of whomever had placed it there. All that was left was to push the door open and move to the next room. As he slid the tent flap back, Azix immediately noticed that it was much larger on the inside rather than the outside. He stepped inside and stared curiously around the room, finding an altar set up in the center. With his hearing back, the sounds of the four fey-like beings from earlier drew Azix's attention to them. They carried the injured one from the carpet over to the altar. Once the injured one had been placed on the altar, the four sprites began weaving their bodies in a strange dance. As they danced, they vocalized a lilting melody that reacted with the runes around the altar, causing it to glow. As their voices grew louder and the glow filled the tent, momentarily blinding Azix. Azix blinked his eyes as the glow faded and saw that the injured sprite knelt in the center of the altar, except was now of similar size to the two Kouen men present. He was not too surprised to learn that the 'little dude' had been a female, somehow it seemed right. Azix watched her remove a green emerald which she set before her. The four sprites' movements increased, their vocalizations growing louder until they began to shimmer. Azix watched as the tiny dudes turned into Rukh and were absorbed into the emerald when the larger one began to sing. Azix was fascinated by the magic being displayed before him and saw her approached with the emerald. He accepted the gem with a nod, "Thank you." He was startled as she kissed his cheek and then laughed as she kissed Garret on his lips. With a bow, she walked back to the altar, pointing at the door on the other end of the room. Azix gave her a small bow and crossed the room to examine the door. Etched into the door was a slot big shaped to match the emerald in his palm. He placed it inside of the depression and heard a clicking noise as the door unlocked. The emerald fell into his hand and Azix looked back to find that the sprite had shrunk back to her normal size. "See ya, little dude." Azix nodded to Garret before pushing open the door and stepped through. Garret's hearing returned, and the Magician walked into the tent right behind Azix. The place was spacious, and Garret understood that it was likely due to some form of magic. The small sprite was lain upon an altar within the tent, with several magical symbols written in a circle around the altar. The other sprites began to do some sort of dance while singing in beautiful voices. He engraved the sound they made within his mind, closing his eyes as he listened to it. At that point, he sensed the growing light behind his closed eyelids, in much a similar manner as looking towards the bright sky with one's eyes closed. When the light died down, curiosity gave him cause to open his eyes back up, and watch the happenings before him. Much to his surprise, the fifth Sprite had grown in size and had the obvious curvatures of a woman. Though the female sprite's looks were undoubtedly enticing, Garret did not feel a sudden desire due to the newest change in the appearance of the sprite. He was still fascinated at what he was witnessing. The change in note, a melancholy addition, caused Garret to frown, if just slightly. He watched as the four began to taper off into the pure energy of Rukh, and flow into the gem that had been laid down upon the alter. It was a surprising and sad sight, but Garret understood the feeling behind it; they were sacrificing themselves for some purpose. The purpose must have been important, as the sprite looked at it with a resolve that was born from understanding that the painful was sometimes necessary. She moved towards Azix, and Garret watched as she offered the gem. Azix smiled and thanked the sprite, who suddenly placed a peck of a kiss upon his cheek. Garret raised an eyebrow at the act. A part of their way of life, perhaps? A means of thanking another, likely. She approached Garret as well, and paused in front of him. Believing that she wanted to extend a similar expression of gratitude to the magician, Garret smiled back to her, slightly, as a polite gesture to indicate that she may continue. What happened next, Garret did not expect. The sprite giggled just before she leaned forward. His lips, slightly parted from the smile, was met by hers. Though he had performed a respiratory technique in the past on one of his female staff, this was the first actual kiss that the Magician had experienced. The feel of her tender lips brushing against his caused a slight stir from the center of his being. There was a very big difference when the intent behind the meeting of their lips was for something other than survival, and the particular mood behind their current situation gave meaning and reason behind the action. His inexperience up to this point had armed the Blue Magician with the armor of ignorance against certain desires, but this latest development had caused Garret to immediately become self conscious. He became painfully aware of the sprite's clothing. He very nearly attempted to continue the action when the sprite pulled away, yet the blue Magician quickly regained as much of his composure as he could. There was no stopping his face from going red, as the Magician worked furiously on slowing and calming his beating heart. Azix laughed, but would not have much more of an opportunity to view Garret so far out of his element. The sprite bowed to Garret and, almost out of reflex, he immediately returned the bow. The bright light from the sprite flashed before them, and the sudden change gave Garret the opportunity to gather himself by the time the light had faded. He looked at the sprite, now back to her smaller form, and cleared his throat, subconsciously brushing his lips with a thoughtful look upon his face. The sprite pointed towards the door for examination, and Garret followed the light magician. The sprite fluttered about the two, almost playfully, before making its move to leave. "Keep safe." The magician's voice was somewhat gruff, an obvious change from his usual demeanor. If Azix poked fun at Garret, he would simply clear his throat again and look elsewhere; the image of the event was burned clearly in the Magician's memory. Once the door was ready to pass through, Garret would follow Azix. Opening the gate, another world is found inside. Azix and Garret would find themselves standing beside a river that quickly falls into a glorious waterfall. The entire area surrounding them seems to be made up of massive trees and giant mushrooms. There is an eerie green glow about the place, though it is not as murky as the previous room. Visible from the edge of the cliff, there is an island floating in the middle of the room, connected in four different places. The side facing the two magician's will reveal that where the extensive vine-work meets the island, there is a glowing door. The other three vine-paths seem to connect to holes in the wall. The only way to access the other three paths is to first visit the island in the middle of the room. Before the men would have a chance to move very far, a rodent-screech and flutter of wings would alert them of something incoming. Their entrance to the room had garnered the attention of the local wildlife and they would be approached by a group of Ratwings. Description: Ratwings fly at 10m/s and are 3 meters large. Abilities: Ratwings deal C-tier damage with their claws or teeth. These creatures will, upon spotting the two magician's, immediately begin to form into a circular formation and dive towards the men at ten meters per second, attempting to hit them with Circling Death. Seeing the embarrassment on Garret's face from the sprite's kiss, Azix held his tongue and decided against teasing the man. He was sure that if he were in Garret's shoes, he would appreciate it being ignored. There were certainly moments with Ari that Azix would prefer Garret did not hear, for fear of being embarrassed. Moments like nearly throwing up on Ariella after an attempt to see if he could handle making out with her. Azix simply accepted having seen this softer side of Garret than normal and continued through the door. Once inside, Azix found himself within a thick forest, next to a river that flowed out some distance before dipping over the horizon. Farther out, Azix saw a large tree with mushrooms growing out of it in the center of the room. From where he stood, Azix noticed four thick long vines stretch from the island to different pathways around the room. He had only a moment to glance at Garret to study his reaction when he heard a rodent-like screech overhead and the flutter of wings. Azix wondered briefly if it was more little dudes, but upon looking up he saw a terrifying sight. Circling above them were five large rats with equally large wings that held a green tint. It seemed like everything in this dungeon so far was stained with a hint of green. 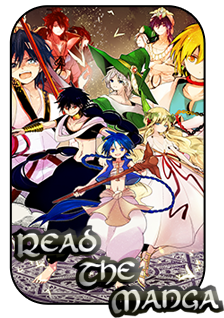 Reacting immediately, Azix held his staff in his left hand while his right hand found his magic carpet once again. With a quick step, he stood onto the carpet and ascended upward to meet the creatures in their dive. When the Ratwings were close enough, Azix called to the Rukh to form his Clear spell. A film of magoi wrapped around his body before expanding violently outward in a dome shape. In Azix's experience the spell was strong enough to deal some serious damage to his opponents and he hoped his estimation was right that it would be enough to stop these creatures. Description: The caster creates a film of force around themselves that pulsates outwards in the shape of a dome at 20 m/s. This pushes anything around the caster back up to 15 meters away. When the force hits something it deals B-tier damage or reaches 15 meters it comes back to cover the caster once again. If sustained, once per post another pulsation from the filmy substance will expand outward again. Azix made no mention of the encounter he had with the sprite, and for that he was grateful. As they entered through the gate, Garret squinted his eyes at the change in environment. It was quite the strange experience, no matter how many times in the past he had gone through it. He looked to the side, noting a stream of water that was rushing off the edge. He could hear the crashing of the water below, and recalled the waterfall that was a small distance from his home in Remano. A small sense of nostalgia rushed over the Blue Magician; it had been quite some time since he had last been there. The weeks and months leading up to Azix and Garret embarking upon their journey to Imuchakk had been filled with work, and Garret had only short opportunities for times of relaxation. Nothing big enough to allow him to visit his home. In the distance, at the end of a series of vine-like bridges, the island seemed to have extensive vine-work around it. Some of the vines connected to holes in the wall, and it looked like the only way to get to the other sections of the room was to first visit that center island. Even so, the center island seemed to have a glowing door which, he believed, would undoubtedly be their way to the next floor. He briefly wondered if there was merit in exploring this room before he heard a screech from above. His disorientation from entering the new room combined with the sudden change of environment had left him flat footed, and it was Azix who had reacted first. The Light Magician jumped onto his carpet to meet the creatures in the air as Garret brought out, once again, his blade Desceld within his right hand and his wand, Kuroi Shimo, within his left. He watched carefully, supporting Azix to the best of his ability. If any of the opponents were still alive after the clash, Garret would aim the best he could to ensure he didn't hit Azix while hitting the maximum number of opponents with two separate 1 meter diameter streams of water from Jet Stream. As the Ratwings began their dive on the two magicians, they were not prepared for the Light Magician to fly directly in the middle of them and use the Clear spell, knocking all but one of the creatures out of the air with a raucous cry. Garret’s Jet Stream took care of the final Ratwing, bringing it fluttering down to the ground. Once the Ratwings were down, the two men would be free to approach the edge of the precipice. If they were to look down, they would see it was a rather extensive drop, over fifty meters. At the bottom, a careful eye might note the green tinge became murkier and at the end of the waterfall, the trees from the swamp could be seen. It would appear they were directly above the Main Hall of the dungeon. To the left of the men, the waterfall would cut off access to walking as the water rushed over the rocks. To the right, a path was worn to the massive vines that connected to the suspended island. If they were to choose to walk on the vines, they would find the plants sturdy but slick with dew, making it dangerous to walk on. Where the vines met the island, a door with mystically glowing runes around it could be clearly seen, appearing welcoming. However, with the assistance of the flying carpet, the men could also access the other vine-bridges surrounding the island. The men would have to make the choice to either access the floating island and whatever dangers it may contain or to try and speed their path through the dungeon while battling the flying creatures that could be seen diving and swooping in large groups around the open area. Azix watched two streams of pressurized water hit the final Ratwing after his own spell dissolved into dust. He turned to flash Garret an appreciative smile, as always the man had Azix's back. His magic carpet settled back down to the ground next to Garret and he offered the man a ride across to the floating island. If Garret did not accept, Azix would guide the carpet to hover a few inches off the ground, alongside Garret as he walked. If Garret did accept, however, Azix would guide the carpet over to the edge of the cliff, where his eyes would follow the river from its crest down to the murky depths. 'That looks like the previous room...' he thought to himself. After studying the bottom of the waterfall, he would maneuver the carpet towards the right until they came to the vine-bridge. Across the way, he found a door surrounded by glowing runes. The carpet sped several inches over the bridge to cross over to the floating island. Azix kept an eye out for the any of the flying creatures that could be seen or any threats on the island itself. If they did not come across any enemies on their journey over, Azix would gaze in each direction to the other areas of the room that the island connected to. He looked for any signs of another door in case the island's was a fake. If nothing caught his eye, he would finally approach the glowing runes and study the door. Garret nodded to Azix, hopping onto the back of the carpet. He leaned his back against Azix's back. "I'll keep an eye out on what approaches us from this direction." If anything attempted to sneak up on the two of them, Garret would be able to see it. This would provide the two with the best possible range of view for anything that would attempt to take their lives. "Just let me know if there is anything from in front that needs both of our attention to handle." Garret continued his watch, blade in right hand and wand in left. "How much further do you think this dungeon goes? One more room? Two more? It feels like it has been such a long time since we went through the previous one that I can't even recall how far each room... Or perhaps it would be better to call it a 'floor', went." As the two men would come nearer to the door, the runes would glimmer brightly before four large tendrils would grow rapidly near the entrance to the door, sprouting at each of the four corners of the doorway. The tendrils would begin whipping back and forth in a frenzy, guarding the doorway. It would seem this would need to be defeated before they could hope to enter the island formed of vines and fungus. The doorway was only about 2 meters across, so the four Tendril Growths had no problem completely covering the door, the glow hidden by the green growths barring the path. If the men would choose to move around the island, about 40 meters to the side of them would be another group of Ratwings. They could either fight their way into the island or try to fly around and battle the flying enemies from the carpet. Description: Tendril Growth is 9 meters long and 1 meter thick. They cannot move from their rooted spot. Abilities: Tendril growth can whip around at 20 m/s and deal B-tier damage. Azix nodded as Garret sat in position to keep an eye out behind them. Typical of the blue magician to be ever vigilant and Azix had to suppress a smirk. When Garret mentioned how many floors they had traveled in Bifrons, the yellow magician reached for his box of memories. Sifting through them, he found the correct ones and visualized the faded events. "I believe we went through three floors, but it may have been four. So far this dungeon seems vastly different than the one before." As the magic carpet glided across the vine bridge towards the floating island, the runes upon the door began to glow with an intensity. Azix tilted his head and watched as four nine-meter long tendrils grew from the door flicking violently around. He nudged Garret with an elbow to alert him of trouble and slowed the carpet down. "Trouble at my twelve o'clock. I guess I'm not the only fan of tendrils." Azix gripped his staff tight in his left hand and glanced back to the blue magician with amusement in his eyes. He remembered during their spar on the beach, Garret had used a particularly nasty spell that had shattered Azix's Borg. Raising his staff in the air, Azix shouted, "Bloop Boom it, Jessie!" If Garret didn't understand what Azix meant, he would give an annoyed look and sigh. "The combination spell you hit me with during our spar." If Garret defeated the tendrils, Azix would fly to the door to proceed to the next room. Garret watched their back while they made their way across the vine, yet Azix brought his attention to the problem ahead of them. Garret turned on the carpet, looking over Azix's shoulders. He frowned as he saw the creatures that were defending the door. When Azix told the magician to use the 'bloop boom', Garret looked at him in confusion. "What do you..."
His explanation of the spell, combined with what he called it, caused Garret to sputter out a laugh. "Pffft. Sure thing, but hold on to the carpet tightly, and stop in a few meters here." He would put his hand on Azix's shoulder when they were 37 meters away from the creatures. Garret summoned forth a ball of ice above his head and leveled it towards the creatures ahead of them. Shooting forward, the ball stopped at 10 meters away and exploded in a fury of destruction; the resulting Ice Explosion would be devastating. Garret would follow Azix's lead, entering the door as well if there were no further hinderences to doing so. The Ice Explosion was more than sufficient to destroy the tendrils, the combination of ice and sound utterly destroying the plants. The side effect of this was the damage suffered to the vine bridge to the doorway. The runes seemed to have kept the door itself safe, but the vines leading to it were barely hanging on, the frozen shrapnel nearly severing the delicate plant life helping to keep the island suspended. Luckily, the other three vines were still strong enough to keep the island afloat, even if it did tilt slightly. When the two men would enter the door, they would find it nearly dark inside, with only a few candles illuminating the interior. There was a table in the center of the room with three Onyx pieces setting on the surface. The gems looked to be carved into the shape of thorns and were neatly arranged. In a dark corner, near the ceiling, they would see only a vicious smile looking down on them along with a pair of eyes that seemed to be attached to nothing. A deep, playful voice seemed to echo through the room, coming from the floating mouth but also seeming to come from all other directions as well. Suddenly, the two men would experience very similar things but neither would be aware the other was experiencing it. It would be something each experienced in their own mind. They would each see a figure approach, similar to the full grown figure of the sprite from the previous area, but instead of a green sheen, her skin was dark like the onyx on the table. The woman, with a sultry look on her face, would circle each of the men, no weapon apparent. If they attempted to attack her, they would find their spells and weapons met nothing but air, unless they were unfortunate enough to point the spells at each other. She would run a finger up their arm before leaning in close and whispering to them, the message the same for both of them. With those words the woman would come around to the front of them, giving them a look of temptation and promise of greater things. The smiling face near the ceiling would simply watch and see how the men reacted. The results were likely to be very telling.